In the previous pAsuram, AzhwAr mercifully mentioned the meaning of charama SlOkam. When asked as to what is the benefit for those who are deeply engaged with that, he says in this pAsuram the prAypya vaibhavam (distinctions of the goal – emperumAn). He says that even brahmA, rudhra et al do not know the greatness of emperumAn and the greatness of his position. Alternatively, it can be said that AzhwAr is saying that it is not that only the samsAris do not know the distinguishing features of charama SlOkam. Even knowledgeable entities such as brahmA, rudhra et al do not know the greatness of charama SlOkam. periyavAchchAn piLLai, one of the commentators for this prabandham would say that bhattar (parASara bhattar, son of SrI kUraththAzhwAn) would give the meanings of both previous pAsuram, which are very difficult to know, and this pAsuram with the quotation”bhattar aruLichcheyya nAn kEttEn” enRu (nam)piLLai aruLichcheyvar” ((nam)piLLai would mercifully say that bhattar would mercifully state the meanings of these pAsurams). ArE aRivAr anaiththulagum uNdumizhndha pErAzhiyAn than perumaiyai – who will know the greatness of the one [emperumAn], who is like a great ocean which is referred to as in SrI rAmAyaNam yudhdha kANdam 19-31 “apramEyO mahOdhadhi:” (the ocean whose greatness cannot be measured), who keeps all the worlds in his stomach during deluge so that they are not injured, and who lets them out later? pEr AzhiyAn – one who is like a great ocean. Azhi – ocean. This is as per periyavAchchAn piLLai’s interpretation. 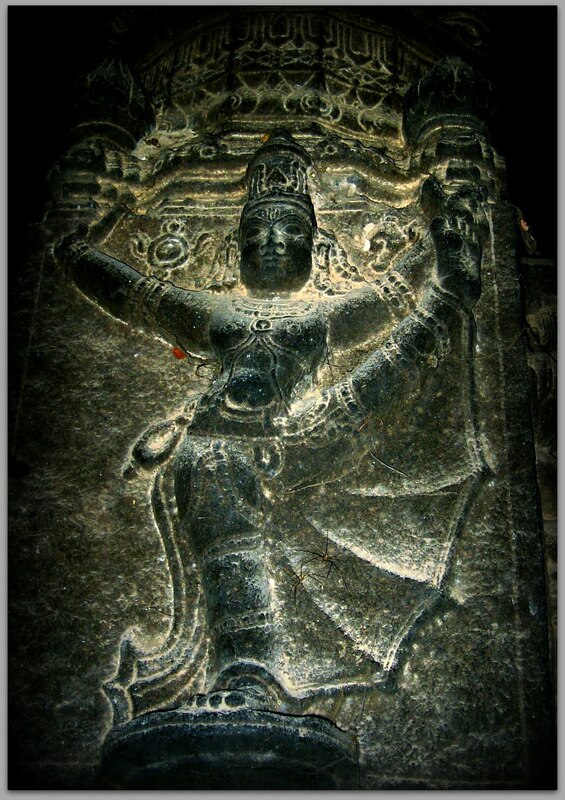 appiLLai’s interpretation is different – “krishNa who is donning the great divine disc (sudharSan chakra, also known as Azhi in thamizh) in his divine hand”. Would brahmA, rudhra et al know? . . .
kAr seRindha . . . . – Let their knowing his greatness remain on one side. AzhwAr is wondering whether they know where paramapadham (SrIvaikuNtam) is. kAr seRindha kaNdaththAn – neelakaNta (Siva) who has the vanity of having protected the dhEvas by swallowing the AlahAla poison and having he power which is the base for that. eN kaNNan – brahmA who has eight eyes in order carry out his activities in all eight directions simultaneously and who has lot of knowledge. kANAn – do not see. kAr seRindha kaNdaththAn kANAn – even if one possesses lot of power, is it possible to know the dwelling place of one who is omnipotent? en kaNNan kANAn – even if one has lot of knowledge and is the head of the universe, is it possible to know paramapadham which is beyond the universe? avan vaiththa paNdaith thAnaththin padhi – they do not know the dwelling place which emperumAn created with his eternal desire, long time back. SrI vishNu purANam 1-9-59 says “yan na dhEvA na munayO na chAham na Sankara: I jAnanthi paramESasya thath vishNO: paramam padham II” (that is vishNu’s supreme dwelling place which is not known to dhEvas, munis (sages), me (brahmA) and rudhra); SrI vishNu purANam 1-9-55 says “yannAyam bhagavAn brahmA jAnAthi paramam padhamI thannathA: sma jagadhdhAma thava sarvagadhAchyutha II” (Oh all pervading achyutha! We bow down to that supreme dwelling place of yours which even bhagavAn brahmA does not know and which is the sustaining entity for the universe); mahAbhAratham AraNya parvam 136-18 says “athyarkkAlanadhIptham thath sthAnam vishNOr mahAthmana: I svayaiva prabhayA rAjan dhushprEksham dhEvadhAnavai: II” (the resplendence of the dwelling place of that supreme AthmA vishNu is much greater than the radiance of sUrya and agni. Oh King! Due to such resplendence, it cannot be seen by dhEvas or demonic entities); mahAbhAratham SlOkam “dhivyam sthAnamajaram chApramEyam dhurvigyEyam chAgamair gamyamAdhyam I gachcha prabhO: raksha chAsmAn prapannAn kalpE kalpE jAyamAna: svamUrthyA II” (Oh my lord! Please reach that dwelling place which is aprAkrutha (not made of primordial matter), indelible, inestimable, unknowable, that which can be known only by vEdhas and which is ancient. During each kalpam (a period of time), please incarnate with your divine form and protect us, your servitors). Through all these authentic sources, it has been established firmly that paramapadham is not known to brahmA, rudhra et al. paNdaiththAnaththin padhi – it is the dwelling place [of emperumAn] which is ancient. The interpretation seen so far is based on prApya vaibhavam (glory of emperumAn as the goal). appiLLai has given a second interpretation for this pAsuram, based on charamaSlOka vaibhavam (glory of charama SlOkam). We will see it now. ArE aRivAr anaiththulagaum uNdumizhndha pErAzhiyAn than perumaiyai – who will know the nirapEksha upAya (being means without any expectation) nature of emperumAn who protects all the worlds during deluge so that they are not destroyed, who lets them out during the next cycle of creation, and who is as profound as the ocean? pErAzhiyAn than perumaiyai – is it due to any expectation that emperumAn is always with the divine disc in his divine hand, in order to protect those who are in danger? pErAzhiyAn – one who is donning divine disc which is great in protecting. Wouldn’t brahmA, rudhra et al know? kAr seRindha kaNdaththAn eN kaNNan avan kANAn avan vaitha paNdaiththAnanththin padhi – brahmA and rudhra, who have abundance of knowledge and power will not know charama SlOkam which is emperumAn’s ancient repository for nirapEksha upAyam (means which does not expect anything). emperumAn has kept this as a secret just as people gather wealth and keep it a secret. The meaning conveyed here is that they (brahmA, rudhra et al) do not know the greatness of the means of emperumAn which does not expect anything. paNdaiththAnanththin padhi – padhi – repository. Just as it is mentioned in SrI rangarAjasthavam 2-87 “upAyOpEyathva thadhiha thava thathvam” (means and goal are very important to you) and nammAzhwAr’s thiruvAimozhi 1-3-2 “vIdAm theLidharu nilaimaiyadhu ozhivilan muzhuvadhum iRaiyOn” (emperumAn who is the lord of all, who always gives the clarity of mOksham completely), being emperumAn’s svarUpam (basic nature), being ancient, being the refuge for all, and being known as sthAnam (position), charama SlOkam is called as his dwelling place as it signifies his means without expecting anything. We will move on to the 74th pAsuram next. This entry was posted in iyaRpA, nAnmugan thiruvandhAdhi on August 31, 2018 by T N Krishnan. In the tenth pAsuram, AzhwAr is enjoying emperumAn‘s act of lifting up the gOvardhana hill and protecting [the cowherds and cattle]. 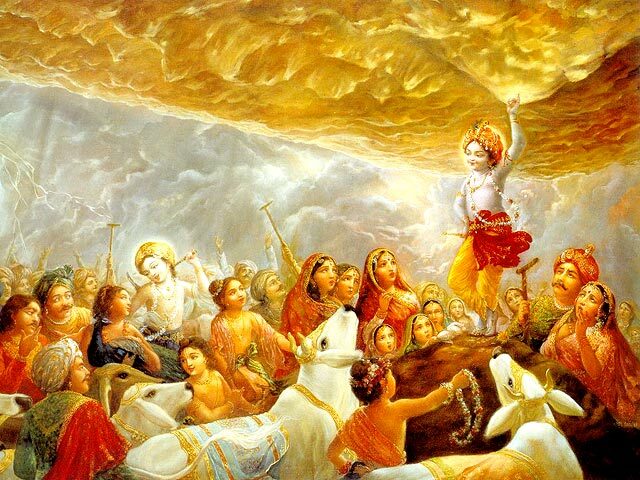 krishNa, who eliminates danger, lifted up the gOvardhana hill, stopped the disaster-causing rain, for the grazing cows to take shelter underneath it, to have the animals residing on the hill roll down and fall, to have the ponds which have water filled up to the top, pour down with a tumultuous sound, and to have the groups of cows and cowherds of thiruvAyppAdi take shelter there. mEy nirai kIzh puga – To have the grazing cows enter underneath the hill, while continuing to chew the grass which they ate, without spitting them out. mA puraLa – Due to lifting up the hill and placing it upside down, the animals which were residing there started rolling down. sunai vAy niRai nIr piLiRich choriya – The water filled in the pond started falling with a sound similar to that from a pot filled with water turned upside down; while trying to save from a rain, he caused many little rains to pour there. ina Anirai pAdi angE odunga – To have the herds of cows and [the residents of] thiruvAyppAdi take shelter there. appan – the benefactor, who helps during disaster. thI mazhai kAththu – As the rain was sent down to bring upon the end, AzhwAr is saying “thImazhai” (fire rain). AzhwAr is considering himself to be suffering then, beyond the cowherds and cows. kunRam eduththAnE – AzhwAr is saying “the great benefactor who lifted the hill and saved everyone”. emperumAn held the hill for seven days thinking “only until indhra’s anger out of hunger subdues, he will pour the rain” and protected everyone. Only if it were rAvaNa et al, could they have been killed? Since it is an unfavourable act by a favourable person (indhra, a devotee), emperumAn could only do this. With this, it is explained that even if a devotee commits a mistake, emperumAn will tolerate that and protect him. This entry was posted in thiruvAimozhi, thiruvAimozhi 7th centum on August 31, 2018 by Sarathy Thothathri. Ninth pAsuram. As srushti (creation) is also distinct for bhagavAn [and not done by anyone else], AzhwAr is considering it to be a victorious act. As per “appan – mudhal ulagam seydhadhum – anRu“, the great benefactor initially created the universe [material realm in manifested state] during the first srushti [i.e. after total deluge, the creation begins once again]. To support this concept “maN nIr …” [the creation of five great elements which is part of samashti srushti [initial creation up to five great elements, before the variegated creation commences]] is highlighted here; alternative explanation – as the previous pAsuram and next pAsuram talk about krishNa’s activities, we can construe that as AzhwAr is thinking that only after winning over bANa, the universe came into existence [previously, it was as good as non-existing], he is talking about that here; it is not sufficient to just raise the crops; only when the crops are protected, they are said to be created. During the initial creation, the great benefactor, who is the creator of the universe, created the universe; he created the five elements starting with earth etc which are the causes and the mountains etc which are worldly objects; he created both moon and sun and other radiant objects; further he created rain, creatures which depend on the rain, the dhEvas who grant the rain and other creatures. Implies that AzhwAr is talking about the initial creation after total deluge instead of subsequent creation. anRu … – He created both cause [five great elements] and effect [variegated creation]. sudar iraNdu – He created the moon and sun. mazhai mEgam – Other souls which survive based on the rain, and the dhEvas who create rain, and other animals/plants. appan – the creator of all. anRu mudhal ulagam seydhadhumE – Do I have to identity all of these individually? On the day, emperumAn punished bANa and eliminated multiple kings [and remained as a singular king for all], he created these; alternative explanation – on the day when the state was as said in thaiththirIya upanishath “sadhEva” (only sath existed, and emperumAn vowed “bahusyAm” (let me become many)). This entry was posted in thiruvAimozhi, thiruvAimozhi 7th centum on August 30, 2018 by Sarathy Thothathri. samsAris told AzhwAr “What purpose is served by despising others saying – mAyan anROdhiya vAkkadhanaik kallAdhAr ulagaththil EdhilarAm? Since you have learnt the teaching of emperumAn, why do you not say the meaning yourself?” AzhwAr gives the meaning of charama SlOkam in this pAsuram. Just as krishNa charama SlOkam is for mahAbhAratham, SrI rAma charama SlOkam for SrI rAmAyaNam, “mEmporuL” pAsuram (38) for thirumAlai dhivya prabandham, this pAsuram is the most important pAsuram for this thiruvandhAdhi. anRu enbAr Ar – who is there who will say that this is not correct? illaRam illennum sollum sollalla – those sayings which state that karmayOgam (path of carrying out deeds mentioned in SAsthras) is the means [to attain emperumAn] are not authentic. Will illaRam (life of householder) refer to karmayOgam? AzhwAr equates this way because only gruhasthan (one who is in a familial life) has control over dhAnam (donating alms), thapam (carrying out rituals) etc which are part of karma yOgam. illennum – Just as it is mentioned in the vAkyam “upAyE gruha rakshithrO: Sabdha: SaraNam ithyayam varththathE” (the word SaraNam is used in the context of upAyam (means), gruha (house), rakshaka (protection)),the words SaraNam and gruha are synonyms. il which refers to gruha thus refers to SaraNam, which is the means. illaRam illennum sollum sollalla – SrI bhagavath gIthA 3-20 says “karmaNaiva hi samsidhdhim AsthithA janakAdhaya:” (people like janaka et al attained mOksham through karma yOgam only); same SlOkam “asakthOhayAcharan karma paramApnOthi pUrusha:” (the sentient entity who observes karmayOgam without any attachment, attains his superior AthmA). SrI bhagavath gIthA 18-46 SlOkam “yatha: pravruththi bhUthAnAm yEna sarvaidham thatham I svakarmaNA thamabhyarchya sidhdhim vindhathi mAnava: II” (sentient entity, by carrying out karma, worships and attains me, from whom he is able to engage in activities such as creation, by whom he is pervaded and exists). All these texts which say that karmayOgam is the means for attaining mOksham are not authentic. thuRavaRam il ennum sollum sollalla – the sayings which mention that gyAna yOgam (path of knowledge) is the means are not authentic. Will thuRavaRam (life of ascetic) refer to gyAnayOgam? Since thuRavaRam has to be undertaken after giving up illaRam (the life of householder), we can say that thuRavaRam refers to gyAnayOgam. In several SlOkas in SrI bhagavath gIthA, it has been established that gyAnayOgam is sanyAsam or karma sanyAsam. thuRavaRam il ennum sollum sollalla – Texts such as SrI bhagavath gIthA 4-37 which says that gyAna yOgam is the means for attaining mOksham “yathaidhAmsi samidhdhO’gnir bhasmAth kuruthE’rjuna I gyAnAgni sarvakarmANi bhasmAth kuruthE thathA II” (Oh arjuna! Just as fire which is glowing well burns out the firewood, in the same way the fire of gyAnayOgam will burn out all the karmas) are not authentic. allana aRam il ennum sollum sollalla – other righteous acts seen as means for mOksham are also not authentic. Which are the other righteous acts which are said to be means for mOksham? (a) SrI bhagavath gIthA 11-54 “bhakthyA thvananyayA Sakya ahamEvamvidhO’rjuna I gyAthum dhrashtum cha thaththvEna pravEshtum cha paranthapa II” (I can be known of, seen and attained only through bhakthi which is fully focussed on me) says that bhakthi yOgam is a means for attaining him. (b) The vEdha vAkyam “dhESOyam sarvakAmadhuk:” (this divine abode will grant all desires, including mOksham) says that living in a divine abode will grant mOksham. (c) vishNu sahasranAma SlOkam “kim japan muchyathE janthu:” (by worshipping whom, jIvan attains mOksham) says that reciting divine names is the means for attaining mOksham. 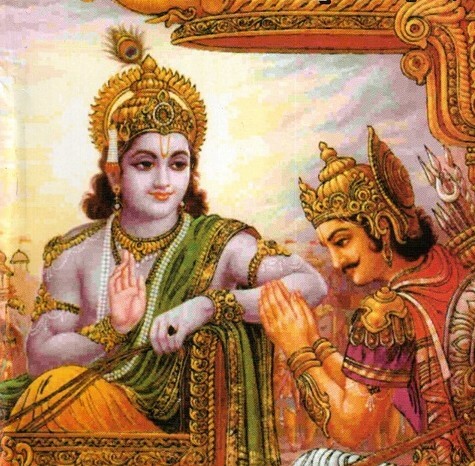 (d) SrI bhagavath gIthA SlOkam 4-9 “janma karma cha mE dhivya mEvam yO vEththi thathvatha: I thyakthvA dhEham punar janma naithi mAmEthi sO’rjuna II” (Oh arjuna! One who knows my aprAkrutha birth (birth which does not take place due to karma) and my activities as they are, will not attain another birth once he gives up his body. He will attain me) says that knowing the secret of emperumAn’s incarnations is the means to mOksham. (e) SrI bhagavath gIthA SlOkam 15-19 “yO mAmEvamasammUdO jAnAthi purushOththamam I sa sarvavith bhajathi mAm sarva bhAvEna bhAratha II” (one who, without bewilderment, knows that I am purushOththama (the supreme being), knows all the means; he attains me through all means) says that purushOththama vidhyai(knowing that emperumAn is the supreme being) is also a means of attaning mOksham. These are referred to as allana aRam here. While these have been referred to as means for attaining mOksham by emperumAn himself in SrI bhagavath gIthA and by various rishis in ithihAsa (epics) and purANas (ancient narrations which appear new), can AzhwAr say that these are not authentic for consideration of mOksham? Since bhagavAn himself has said in SrI bhagavath gIthA 18-66 “sarvadharmAn parithyajya” (giving up all the paths that I have shown as means for attaining mOksham), it could be said that way. In truth, that karma, gyAna and bhkthi yOgas can be said to be means is only for the sake of saying. They cannot be taken as primary. Only that which gives results (on its own) can be taken as means. karma, gyAna and bhakthi yOgams, which are evanescent and which are insentient, cannot grant results on their own. Only emperumAn, who is pleased with them, grants the results. Hence it is nArAyaNa who is primary for granting mOksha. For this reason, AzhwAr’s assertion that illaRam, thuRavaRam, allana aRam are not the means, is the essence of vEdhAnthams. What is the reason for your (referring to AzhwAr) saying that karma, gyAna, bhakthi yOgam etc are not the means? nallaRamAvnavum – aRam refers to deeds. nallaRam refers to deeds which are carried out without any expectation in the results. In other words, karma, gyAna and bhakthi yOgams, which are exclusive for brAhmaNa, kshathriya and vaiSya menfolk are aRam. nAma sangIrththanam (reciting divine names of emperumAn) etc which can be sung by thraivarNikas (the first three classes of people) without any distinction, along with the fourth varNa people and women are called as nallaRam. The advantage of nAma sangIrththanam etc which are referred more by ithihAsa and purANa over karma, gyAna, bhakthi yOgams which are referred more by vEdhas is that they are applicable to all. nAlvEdhamAththavamum – karmayOgam which is spoken of extensively in the pUrvabhAga (earlier parts) of the four vEdhas (rig, yajur, sAma and atharvaNa). This is also applicable to gyAna and bhakthi yOgas which are spoken of in the vEdhAnthams (latter parts of vEdhas). Alternatively, nAlvEdhamAththavam would refer to gruhastha and sanyAsa dharmas (paths of righteousness) which are accepted by vEdhas. nallaRamAvanavum would refer to allana aRam (bhakthi yOgam, thirunAma sangIrththanam etc) and nAlvEdhamAththavamum would refer to illaRam and thuRavaRam. Both meanings are acceptable. periyavAchchAn piLLai considered in his divine mind that thuRavaRam refers to gyAna yOgam and bhakthi yOgam while appiLLai included bhakthi yOgam in allana aRam. nArAyanEyAvadhu – all these give results due to nArAyaNa. Hence, illaRam, thuRavaRam and allana aRam will not be means. Only nArAyaNa who is the refuge for the cluster of nArAs (souls) is the means. When he is the means, there is no need for their support. nallaRamAvanavum nAlvEdha mAththavamum nArAyanEyAvadhu – “sarvE vEdhAs sarvavEdhyA: saSAsthrA: sarvE yagyAs sarva ijyAScha krishNa: I vidhu: krishNam brAhmaNAs thaththvathO yE thEshAm rAjan sarvayagyAs samApthA: II” (Oh King! All vEdhas, SAsthras, materials which are known (through them), all rituals, the dhEvas who are worshipped in those rituals are all only krishNa. For those brAhmaNAs who know krishNa truly, all rituals are completed). Idhu anRu enbAr Ar – Who can refute this meaning? Has this not been felt by experts in vEdhas along with experts in bhagavath vishayam without any distinction? 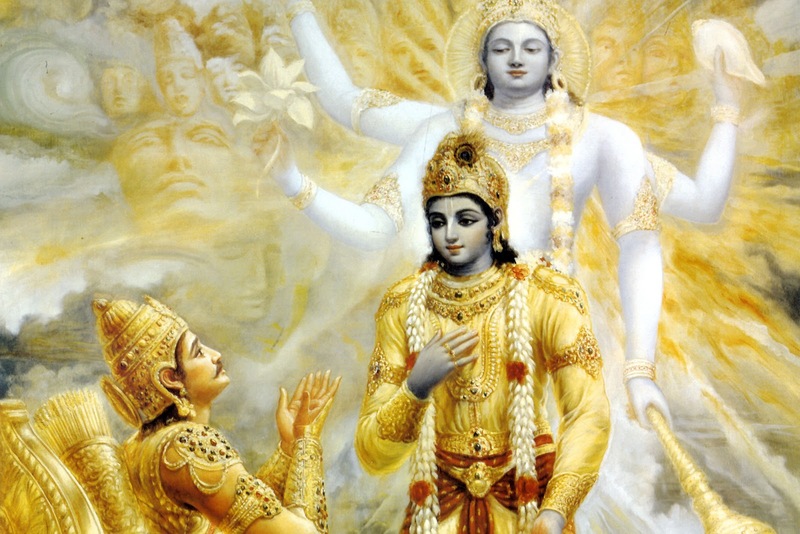 Has it not been said in mahAbhAratham vana parvam 71-123 “yE cha vEdhavidhO viprA yE chAdhyAthmavidhO janA: I thE vidhanthi mahAthmAnam krishNam dharmam sanAthanam II” (brAhmaNas who know vEdhas and elders who know the basic nature of souls know that krishNa is the age-old dharma (righteousness))! Idhu anRu enbAr Ar – there are many authentic sources to claim that paramapurusha (supreme being) is the means for mOksham. Some of these are: “nArAyaNam – pArAyaNam”, “mumukshurvai SaraNam aham prapadhyE”, “lOkAnAm thvam parOdharma” (SrI rAmAyaNam yudhdha kANdam120-15), “rAmO vigravAn dharma”( SrI rAmAyaNam AraNya kANdam 37-13), “krishNam dharmam sanAthanam” (mahAbhAratham vanaparvam 71-123), “pAvanas sarvalOkAnAm thvamEva” (SrI rAmAyaNam uththara kANdam 82-9), “pavithrANAm hi gOvindha: pavithram paramuchyathE I puNyAnAmapi puNyO’sau mangaLAnAncha mangaLam II” (mahAbhAratham vanaparvam 88-27, among the pious entities, gOvindha is the most pious; among the virtuous, he is the most virtuous and among the auspicious, he is the most auspicious). “mAmEkam SaraNam vraja” (SrI bhagavath gIthA 18-66), “thamEva SaraNam gachcha”, “thamEva chAdhyam purusham prapadhya ”, “SaraNam mAm prapdhyasva”. AzhwArs too have sung several pAsurams conveying the same meaning “aRandhAnAyth thirivAy”, “nAgaNaimisai nambirAn charaNE SaraN namakku”, “neRivAsal thAnEyAy ninRAnai”, “nArAyaNanE namakkE paRai tharuvAn”, “kaLaigaN nIyE”. Is there anyone who will deny this great meaning? How is this pAsuram expounding charamaSlOkam? We will move on to the 73rd pAsuram next. This entry was posted in iyaRpA, nAnmugan thiruvandhAdhi on August 30, 2018 by T N Krishnan. In the eighth pAsuram, AzhwAr is reminiscing [krishNa’s] victory over bANa. kaNdIr – see [it is well known]! On that day when krishNa who helped anirudhdha, won over the strong shoulder’s of bANa who sided [with rudhra et al], subrahmaNya, who has peacock flag, fell down, unable to resist; further, agni, with rising flame, fell down, unable to resist; further, rudhra, the the chief among dhEvathAs, having great power due to having three eyes, ran away from the battlefield; aren’t these well known? nEr sarindhAn kodik kOzhi koNdAn – subrahmaNya who has peacock as his flag, is the commander-in-chief of dhEvas, like a colt (young one of a horse) in the battlefield, lost in the beginning itself. pinnum … – At that time, the forty nine agni dhEvathAs appeared with great fervour, only to run away. pinnum … – rudhra hiding his flag thinking “our son pridefully showed his flag only to be insulted in the end” arrived there; immediately he lost the battle and was running away, covering his third eye. While he ran, hiding his eye, AzhwAr catches him red-handed by saying “mukkaN mUrththi kaNdIr” (see the one with the third eye) and reveals his identity to everyone. Whatever one may do, one cannot hide one’s main bodily identity. This sorrow is beyond words and cannot be even said as “the sorrow inflicted upon me when bANa’s thousand shoulders were severed”. appan – causeless protector. nEr sari vANan – Now the chief, bANAsura is coming; he too runs away from the battlefield – says AzhwAr; or AzhwAr is saying “he is turning around from wherever he is standing to look away [indicating that he has given up fighting]”. Those who dropped the weapons and those who showed their hair [i.e. their back, turning away from the battle] cannot be killed. thiN thOL koNda anRE – bANAsura remained firmly as if remaining in a fort, holding on to a dhEvathA (demigod) who is as good as himself. He remained free from fear holding on to rudhra, who has skull attached to his palm [due to a curse], similar to those who are surrendered to the supreme lord. He pretended similar to those who remain as said in thaiththirIya upanishath “na bibEthi kuthaSchana” (Those who are surrendered to sarvESvaran do not fear anything). thiN thOL koNda – Considering “ushA cannot become fatherless”, he just severed bANa’s hands. It is due to his having many hands, he fell at the feet and worshipped any dhEvathA he saw. Due to this, krishNa severed his hands and made him lord-less. While it is ordained that one should use the body and limbs in the service of emperumAn as said in SrIvishNu dharmam “yau thath pUjA karau karau” (only those hands which worship emperumAn are called hands) and SrIvishNu dharmam “vichithrA dhEhasampaththir ISwarAya nivEdhithum …” (Oh brAhmaNa! To offer oneself and other materials, AthmA previously got connected to the amazing body with hands and legs), he engaged his thousand hands in inapt matters and hence emperumAn severed them. As the dhEvathA (rudhra) himself came begging and prayed to emperumAn “Can you who made me a dhEvathA, invalidate it? If you kill my devotee, no one else will come and surrender unto me”, he let bANa live. 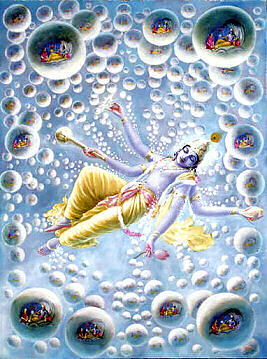 SrIvishNu purANam 5.33.41 “krishNa krishNa mahAbAhO jAnEthvAm purushOththamam” (krishNa! krishNa! Oh mighty armed! I know you as the best among the men) – [rudhra says] without realising your true nature, I just saw your shooting posture and thought that you were just a warrior; like those who say “only after aiming and marking my neck, I realised the true nature”. With this, it is explained – everyone other than ISvara, while they are doing well, they will consider themselves to be the protectors and when they are in danger, they will lead the danger to their devotees and they will escape; it is explained that since in every situation, sarvESvaran will protect his followers by transforming himself, even in dire situations, he is the only one who is fit to be surrendered unto; others are not to be surrendered. This entry was posted in thiruvAimozhi, thiruvAimozhi 7th centum on August 29, 2018 by Sarathy Thothathri. It is not that we do not know that emperumAn protected us during the time of worldly deluge. AzhwAr feels sad not only for this but also for the fact that we do not know till date the charama SlOka (ultimate verse) that emperumAn gave us when he tried to lift us from the deluge of samsAram (materialistic realm). sEyan – emperumAn is at such a far away distance that brahmA, rudhra et al would not know about him. Did not brahmA say in SrI vishNu purANam 1-9-55 “yanna dhEvO na munayO na chAham na cha Sankara: I jAnanthi paramESasya thath vishNO: paramam padham II” (dhEvas (celestial entities), munis (sages), I (brahmA), rudhra do not know the superior nature of that paramESvara (supreme being) vishNu) and in mahAbhAratham mOksha parvam “na sa Sakyas thvayA dhrashtum mayAnyair vApi saththama I sarvEshAm sAkshibhUthO’sau na grAhya kEnachith kvachith II” (Oh child, rudhra! That emperumAn is not capable of being seen by you, me or anyone else. Even though he sees everyone, he cannot be seen by anyone at any time)! emperumAn himself has said in varAha purANam “adhyApi mAm na jAnanthi rudhrEndhrAs sapithAmahA:” (rudhra and indhra, along with brahmA, do not know me even today) and in SrI bhagavath gIthA 7.25 “nAham prakASa: sarvasya” (I do not manifest to anyone)! This same meaning has been brought out by SrI vishNu dharmam SlOkam “na yasya rUpam na balaprabhAvau na cha svabhAva: paramasya pumsa: I vigyAyathE SarvapithAmahAdhyais tham vAsudhEvam praNamAmyachinthyam II” (I bow down to that supreme being vAsudhEva whose divine form, greatness of strength and qualities are not known by brahmA, rudhra et al). bahvrucha Sruthi also said “na thE vishnO jAyamANO na jAthO dhEva mahimna: paramanthamApa” (Oh vishNu! No one who has been born earlier or is going to be born in future, knows the outer limit of your greatness). What is the reason for not being known? aNiyan – he will be close at hand for those who have just a little bit of desire to see him. sEyan – aNiyan – he is very far away from people such as dhuryOdhana and those who attempt on their own to see him. He is close at hand for people such as yaSOdhA and those who look up to him. Hasn’t nammAzhwAr mercifully said in his thiruvAimozhi 1-3-4 “yArumOr nilaimaiyan ena aRivariya emperumAn yArumOr nilaimaiyan ena aRivu eLiya emperumAn” (for those who attempt on their own, emperumAn is difficult to be estimated; for those who attain him through his grace, he is simple to be estimated)! How is he so close at hand for the favourable ones? siRiyan – since he is born below the levels of his followers, due to his desire, he manifests himself as a very simple entity. sEyan aNiyan siRiyan migapperiyan – ALavandhAr, one of the preceptors in the lineage of our AchArya gurupamparai, combined these four divine names in this SlOka from sthOthra rathnam “namO namO vAngmanasAdhi bhUmayE namO namO vAngmanasaika bhUmayE I namO namO’nantha mahAvibhUthayE namO namO’nantha dhayaika sindhavE II”(salutations to you, who are difficult to attain for the words and minds of those who attempt to attain you on their own; salutations to you who are easy to attain for the words and minds of those who see you due to your grace; salutations to you who are having unlimited, huge wealth; salutations to you who are like an ocean of mercy). Since mercy is the reason for his incarnation as vAmana (dwarf), ALavandhAr is calling emperumAn as anantha dhayaika sindhavE . AzhwAr gives an example for emperumAn’s quality of easy approachability..
thuvaraikkOnAy ninRa mAyan – leaving aside his role as head of both vibhUthis (material and spiritual realms), he stood as the head of dhwArakA. mAyan – one with amazing activities. Apart from being easily approachable by favourable entities, he earned the ill-fame of “hiding in dhwArakA from the lowly jarAsandha after losing to him” only because he wanted to help his favourable person bhIma to kill jarAsandha. periyavAchchAn piLLai, one of the commentators for this prabandham said that Ayan thuvaraikkOnAy ninRa mAyan is the explanation for the terms aNiyan siRiyan while another commentator, appiLLai considered the term Ayan as the explanation for aNiyan siRiyan and the words thuvaraikkOnAy ninRa mAyan as the explanation for the words sEyan periyan. As an example for these two, he says that emperumAn had the simplicity of being born in the clan of herdsmen and, having the greatness of being the controller of dhwArakA, he took multitudinous forms in order to dance with ten thousand women, thus exhibiting his amazing activity. mAyan anRu Odhiya vAkkadhanaik kallAr – those who did not learn the true words which krishNa recited at the beginning of mahAbhAratha war. Those who did not learn through their AchAryan (teacher) the charama SlOkam (ultimate hymn) as said in SrI bhagavath gIthA 18-66 “sarva dharmAn parithyajya mAmEkam SaraNam vraja I aham thvA sarva pApEbhyO mOkshayishyAmi mA sucha: II” (giving up all righteous activities along with their traces, attain me (who is having qualities such as easily approachable etc) as the means. I (who am having qualities of knowledge and power) will liberate you from all hurdles. Do not grieve). aNiyan siRiyan Odhiya vAkku – AzhwAr explains the qualities of easy to approach etc, as mentioned in the term mAm. sEyan periyAn Odhiya vAkku – AzhwAr explains the qualities of knowledge, power etc as mentioned in the term aham. thuvarikkOn – this explains that he is the swAmy (lord). mAyan – without distinguishing between his qualities of saulabhyam etc and his qualities of gyAna, Sakthi etc. kallAr ulagaththil – is it that only one or two persons in this world do not know charama SlOkam? AzhwAr says that most of the people do not know the meanings of charama SlOkam. What is the reason for not learning this? mey gyAnam il – the reason for not learning this is the absence of true knowledge about thathva (knowledge about sentient, insentient and ISvara entities), hitha (knowledge about the means to attain emperumAn), and purushArtha (knowledge about the goal to be enjoyed after attaining emperumAn’s divine feet). What is the reason for not having this knowledge? EdhilarAm – being haters of emperumAn. Edhilar – enemies. As mentioned by emperumAn himself in SrI bhagavath gIthA 16.19 “thAnaham dhvishatha: krUrAn samsArEshu narAdhamAn I kshipAmyajasram aSubhAn AsurishvEva yOnishu II ” (I push those who hate me, who are cruel and the lowliest among men into samsAram, and there too, in the clan of demons) and in “AgyAchchEdhI mama dhvEshi” (one who crosses my order is one who hates me), emperumAn considers in his cool mind that these people are his haters. As mentioned in SrI rAmAyaNam yudhdha kANdam 106-6 “SathrO: prakyAtha vIryasya” he makes them declare that he (emperumAn) is their enemy. This entry was posted in iyaRpA, nAnmugan thiruvandhAdhi on August 29, 2018 by T N Krishnan. 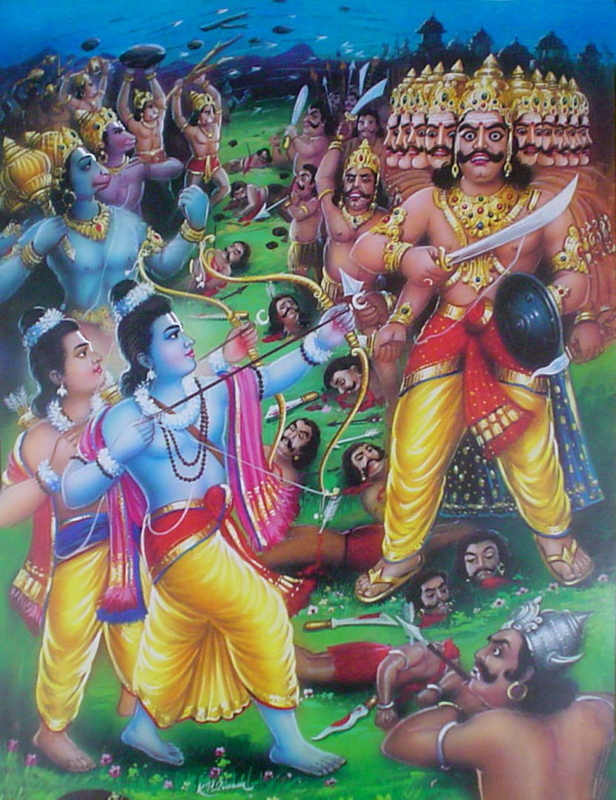 In the seventh pAsuram, AzhwAr is enjoying how rAvaNa was killed. The groups of arrows which were shot, were making great sounds; they caused hundreds and hundreds of dead bodies of the rAkshasas to fall like mountains falling down; the ocean became filled with a flood of blood through the rivers; this is how chakravarthith thirumagan, who is the benefactor of his followers, fought the war honestly, to bring lankA down to ashes. 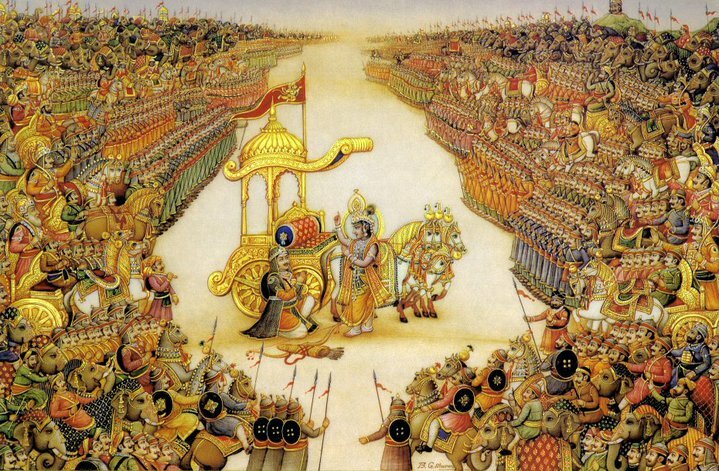 mARu niraiththu iraikkum sarangaL – This is how quickly SrI rAma traversed the battle field. The sound of the arrows which were shot from different directions banged on each other and created huge sound, like the sound of the [turbulent] ocean. 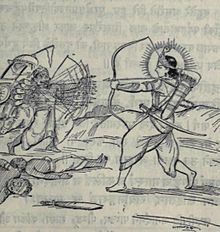 In the speed at which SrI rAma traversed in the battle field, his own arrows which were shot from different directions, banged at each other and caused huge sounds. ina nURu piNam malai pOl puraLa – The many groups of hundreds and hundreds of dead bodies, due to having been pierced fiercely by the arrows, were split into two and both parts of each body were shaking as the soul was interlocked between both the parts. kadal ARu maduththu udhirap punalA – The ocean which is said in SrI bhagavath gIthA 2.70 “ApUryamANam achala prathishtam” (naturally full and motionless), became filled with a flood of blood, and was flowing out through rivers. thirumangai AzhwAr said in periya thirumozhi “vaiymUdu peru nIrin mummai peridhE” (Three times greater than the deluge which covers the world). nIRu pada – To turn them into ashes as said in SrI rAmAyaNam sundhara kANdam 26.26 “smaSANa sadhruSI” (similar to a crematorium). ilangai seRRa nErE – nEr indicates time. At the time when he destroyed lankA. In this case, the pAsuram should be read as “ilangai seRRa pozhudhu – mARu niraiththu iraikkum sarangaL“. Alternative explanation – [nEr indicates his skill] the manner in which he destroyed lankA. Instead of mystical warfare, he fought straight and destroyed lankA. Another explanation – nEr – honestly. Here it means, he destroyed lankA through honest means only. This entry was posted in thiruvAimozhi, thiruvAimozhi 7th centum on August 28, 2018 by Sarathy Thothathri. AzhwAr was asked “You said that this is the substance of vEdhas. How did you find it?” AzhwAr responds saying “I am the one who did not know this till today. Knowledgeable persons knew this all along”. oruvanAgi – it appears that oruvan and vAmana are synonyms. A great entity stood in a lowly manner. One who grants everyone’s wish, stood like a mendicant, asking for alms. Without expecting anything, he stroked everyone with his divine foot. Isn’t this the limit for sauSeelyam, saulabhyam, vAthsalyam etc! Isn’t this entity termed as oruvan! Due to the interest in this meaning and due to the fact that En oruvanAgi has been separately dealt with, this term thAnoruvanAgi can be better combined with the last line irunilaththaich chenRAngu adippaduththa sEy to get a complete meaning. Angu senRu – while emperumAn could have completed the task through his sankalpam (divine vow), he went to the place where mahAbali was, by transforming himself, because mahAbali had the quality of magnanimity. iru nilaththai adippaduththa sEy – measuring the expansive earth in such a way that it came under his foot. Just as it is said “Eka: prAseesarathpAdhamEka: prAchikshaLanmudhA I aparOpyadharan mUrdhnA kO’dhikas thEshu gaNyathAm II” (one stretched his leg; one washed it joyfully; one bore that water on his head. Ponder on who among these three is the greatest), he is the child of whom it could be said that he is without any equal. dharaNi idandheduththu – digging out the earth with his tusk when earth was sticking to the walls of the universe at the time of deluge. En oruvanAy eyiRRil thAngiyadhum – with a unique form of boar; despite being a great entity, since he incarnated as a boar without any pride, his qualities of sauSeelyam, saulabhyam, vAthsalyam were manifested splendrously. AzhwAr calls him as En oruvanAy (unique boar). It could also be construed that AzhwAr is calling him as En oruvanAy since he is a huge boar both in terms of form and beauty. eyiRRil thAngiyadhum – he bore earth in one corner of his tusk. yAn oruvan inRA aRigillEn allEn – I who am without equal in my ignorance, did not know this till now. inRA – until today. But did this matter come to light only after I knew it now? The opinion is that many have known this already. yAn oruvan inRA aRiginRen – Did I come to know of this matter only today? allEn – No; for a long time, many have known it. This entry was posted in iyaRpA, nAnmugan thiruvandhAdhi on August 28, 2018 by T N Krishnan. AzhwAr says that bhagavath vishayam (matter relating to emperumAn) not only has the greatness to avoid any agony to yama. It is also sweet to hear, it is the refuge for earth (people living on earth), complete subject matter for poets (to compose poems) and the meaning of vEdhas (sacred texts). sevikkinbamAvadhuvum sengaNmAl nAmam – the um in this word (sevikkinbamAdhuvum) refers to the agony undergone by yama in the previous pAsuram. It is not only that emperumAn’s divine name removes our being under the control of yama. The divine name of the lotus eyed emperumAn is also very sweet to the ears. It will immerse the person who hears it in the flood of nectar. mAl – one who is affectionate towards his followers; supreme being; sem kaN indicates both meanings. puvikkum puviyadhuvE kaNdIr – Is it that his divine name is sweet only for me? For all the people on this earth, isn’t that divine name the refuge? Has it not been said in the vEdhas “ArthA vishaNNA: SithilAScha bhIthA: ghOrEshu cha vyAdhishu varththamAnA: I sankIrthya nArAyaNa SabdhamAthram vimuktha dhukkA: sukinO bhavanthi II” (if those who have been troubled by the thApathrayam (ills brought on by self, ills brought on by nature and ills brought on by past deeds), if those who fear whether they will be troubled by them and those who are inflicted with terrible diseases, hear the word nArAyaNa they will be liberated from their troubles and will be in bliss)? AzhwAr explained the greatness of the divine name so far. Now he explains the greatness of the one who has the name. kavikku niRai poruLAy ninRAnai – when one has to praise others, since their faults are more, one has to fill up their faults with non-existent abundance in qualities. kUraththAzhwAn (one of the primary disciples of bhagavadh SrI rAmAnuja) has mercifully said in SrIsthavam 3 “anyadhIyAn guNAn anyathra thvasathO’dhirOpya paNithi:” (praise is defined as taking the good qualities of one person, thrusting them on another person who doesn’t have them and singing about the second person). On the other hand, with emperumAn, the situation is that however much one has sung his praises, his svarUpa rUpa guNa vibhUthi (basic nature, divine form, auspicious qualities and wealth) are so much that what has been sung will be very little and what remains to be sung, so huge. Thus he is apt to be called as complete in all respect. Has it not been said in jithanthE sthOthram 1-7 “vachasAm vAchyamuththamam” (supreme being is beyond words)! maRaipporuLum aththanaiyEdhAn – the deep-rooted meaning of vEdhAntham is also the same. I realised that when I tripped, what I got to lay my hands on was indeed an invaluable carbuncle. We will move on to the 70th pAsuram next. This entry was posted in iyaRpA, nAnmugan thiruvandhAdhi on August 27, 2018 by T N Krishnan. In the sixth pAsuram, AzhwAr is mercifully explaining the incident of killing of hiraNya, which is the reason for uplifting of devotees. When the day was ending, emperumAn rose in the form of narasimha, who helps his followers, to create a pool of blood in the youthfully reddish sky at dusk and the surrounding directions, and killed hiraNya, the demon; the method through which he killed the demon looked similar to a lion tearing down a mountain. pOzhdhu melindha – As the day was coming to an end as said in “palitha prAyO vAsara:” (Most part of the day was gone). pun sekkaril – While the sky is reaching the point of dusk. The time between the day and the dusk which was discounted in the boon which hiraNya got from brahmA. He got a boon saying “I cannot be killed in the day and in the night”. vAn thisai sUzhum ezhundhu udhirap punalA – The expansive sky and all the directions became filled with a pool of blood, just as all low-lying regions will be filled with flood waters. malai kIzhdhu piLandha singam oththadhAl – Saying “a lion placing a mountain underneath it and tearing it apart”; alternatively saying “lion which tore it apart, a lion which joyfully tore it apart”. 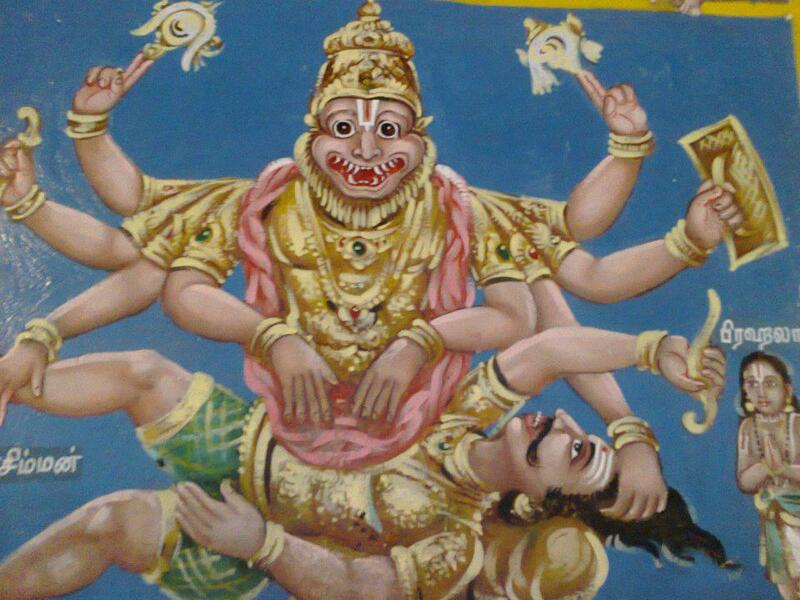 It is said in thiruchchandha viruththam 62 “iraNdu kURu seydhugandha singam” (narasimha, the lion god, who tore hiraNya into two pieces and became joyful). Like a lion which tore apart a mountain in to two equal pieces. appan Azh thuyar seydhu – Looking at the rough face of narasimha, hiraNya experienced everything which he will experience after his death. That is, within a fraction of moment, he experienced the great suffering, matching all the unfavourable actions he did with regard to bhagavAn and bhAgavathas. Causing great sorrow. asuraraik kollum ARE – This is how emperumAn killed the demon. The following principle is explained with this incident. Apart from his common disposition towards all, he would also be the vathsala (one with motherly affection), through the father, mother et al towards the children; if that motherly affection is not present, the same father will become an enemy; even at that stage, only emperumAn will remain the saviour. With this, it is explained that empeurmAn will come and protect immediately as the danger becomes greater. If emperumAn protects when the father himself turns to be an enemy, should we have to explicitly say that he will protect when one becomes an enemy for self? As said in SrI bhagavath gIthA 6.5 “Athmaiva ripurAthmana:” (mind alone is one’s enemy), one is an enemy to oneself [when attached to worldly pleasures]. This entry was posted in thiruvAimozhi, thiruvAimozhi 7th centum on August 27, 2018 by Sarathy Thothathri.